The post office was closed on June 15, 1905 after the railroad bypassed the town and created the town of Frisco a few miles away. The community of Lebanon has been absorbed by Frisco. The Lebanon Baptist Church building was moved to Frisco Heritage Park. All that remains in the original location of Lebanon is the Dunaway Cemetery. March 1, 1860, the U.S. Postal Service granted a post office to Lebanon, with Phillip Huffman serving as first postmaster. during the Civil War, other businesses soon were established. serve the schoolchildren in the community. suburban development in this part of Collin County. M. E. Mallow late candidate for county treasurer was defeated because the other fellow got too many votes. He hasn't forgotten how to extend the glad hand and while he was busy with the other end of an antiquated pipe he winked his weather eye and said farming was mighty hard to beat. He reads the Daily Courier-Gazette and promised the field man a write-up of his recent summer outing and description of the resorts at the head of the famous Salt. Miss Flossie Winton and B. Collinsworth have been of the same faith and order since Nov. 1903. She is a Virginian and he a native of Texas and reared in Collin county. His crop is a splendid one and it was no trouble for him to hand out a big round silver dollar for one year's subscription to the Democrat-Gazette. A. L. Collinsworth has been sharing his griefs, sorrows and joys with Miss Myrtle Johnson for twelve years for it was then that she forsook all to be with him. Mrs. Collinsworth was principally reared in the Lebanon community, and was glad of an opportunity to subscribe for the best paper that Collin county affords, the Democrat-Gazette. Mrs. M. C. Davis whose full maiden name was Martha Drake was in 1889, married to George F. Davis whose demise occurred the 19th of August 1898. Four children, and all boys but one, the latter a girl in her first teens. Her first trip to Texas was during the life of her husband and whose health becoming impaired a return to Tennessee was the only chance to save him but finally succumbed and was no more. Returning to Texas she with the assistance of her three boys and daughter, make a good living and have an extra dollar to provide the home with good literature. Mrs. Davis will appreciate the Democrat-Gazette for it publishes all of the local and county news. I. R. Williams has a wife and two children; a splendid corn and cotton crop, and we take pleasure in adding his name to our big list of readers in southwest Collin. No mud and few rough roads now, but my! the oppressive heat, pesky gnats and terrifying flies. Field Representative Daily Courier-Gazette And Weekly Democrat-Gazette Visits Several Homes And Gives Many Facts About Families And Individuals And Glimpses Into Past History Of That Part Of Southwest Collin - Fine Grain, Corn, And Cotton Growing Farm Land. Lebanon is one of the oldest and most widely known rural villages in the county. It is located on the West Collin-Frisco-Dallas Highway, about fifteen miles southwest of McKinney. 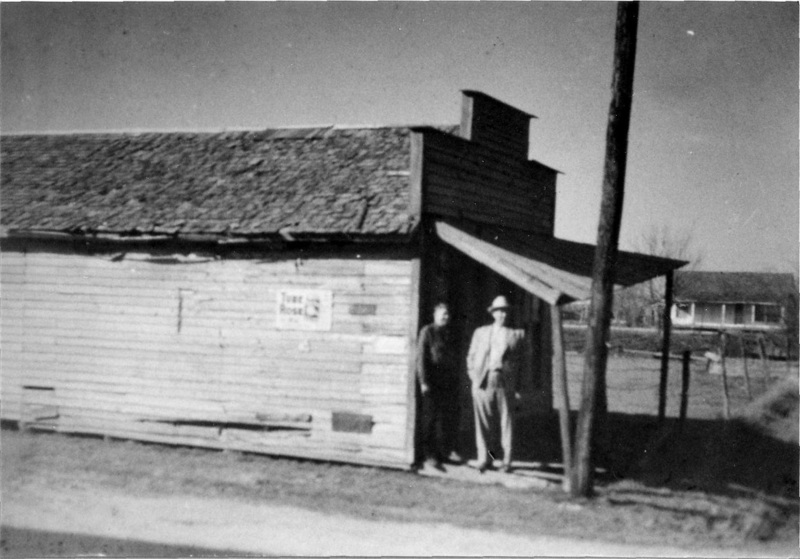 This Daily Courier-Gazette and Weekly Democrat-Gazette scribe recently visited Lebanon, making our first call at the general merchandise store and service station owned and operated by John W. Gribble and wife. The latter was before her marriage, Miss Mamie Cantrell, daughter of Mr. and Mrs. R. A. Cantrell of the Walnut Grove community. She became the bride of Mr. Gribble, seventeen years ago. Her husband is the only son of the late J. M. Gribble and wife, a pioneer couple of the Helms community, located north of Chambersville. Grandmother Gribble is now eighty-six years old. Her health has somewhat failed, and she has been bedfast for the last three or four months, being tenderly cared for in the home of her son and wife, here at Lebanon and by her two lovely young granddaughters, Viola and Billie Dee Gribble. Mr. and Mrs. Gribble have been located here at Lebanon for the past seven years. They appreciate the splendid patronage being accorded them by this community of high class citizens whom they are happy to serve in an ever obliging way. Grandmother J. M. Gribble and her late husband, who now sleeps peacefully in the Chambersville Cemetery, reared a large family of children. The latter are: Mrs. Miller, wife of Dr. J. T. Miller, 4475 Hemphill, Fort Worth; Mrs. S. H. Blake, 208 1-2 East Weatherford Street, Fort Worth; Mrs. W. G. Cosby, 103 1-2 Houston Street, Fort Worth; Mrs. L. N. Stevens on Route One, Anna; Mrs. T. B. Cox, Route 2, Merrel, Texas. The latter was attending the bedside of her dear old mother at the time of our visit. Other children are: Mrs. L. W. Morris, Hebron, Texas; John Gribble, Route 3, Frisco; One daughter, Roberta, wife of Ray Robbins of Plano, answered death's call four years ago, leaving a little son, Wilburn Louis, who is now being cared for by his aunt, Mrs. J. W. Morris and husband at Hebron, Denton County. We also stopped in the home of Mr. and Mrs. C. S. James in this same community. They live in the home of Mrs. James' parents, the late Mr. and Mrs. Norvel J. Grandburg. Mr. Grandburg came from Mississippi, but his wife was a native of Missouri. After their marriage, they settled in Tarrant County, Texas, near Grapevine. Then they moved to the Bethel community in west Collin, thence to a farm west of Lebanon. After retiring they built this home and moved into it. It is a large six room residence with sleeping porch and water piped into the kitchen from a cistern. Mrs. James has a brother, J. M. Grandburg, living near Camey, Denton County, and a sister, Mrs. J. W. Skruggs, Route One, Bernard Street, Denton. C. S. James was born at the old James homestead, one mile north of Frisco. His parents were Mr. and Mrs. W. Gabe James. They immigrated from Kentucky and settled in Tarrant County, as above stated. Mr. and Mrs. C. S. James recently returned from Muskogee, Oklahoma, where Mr. James spent a few weeks in the Veterans hospital. Mr. James has been foreman of the State Highway Department. While working at Cisco, he suffered a heart attack. Upon advice of his physicians he is now at home, taking a rest cure with favorable results, so far. Mrs. C. S. James has always been quite active in Home Demonstration and Parent-Teacher Association activities. However, the illness of her husband has caused her to drop some of her work in these organizations in order to be more constant at the bedside of the mother. Only one church is now located at Lebanon. It is owned by the Baptist denomination, the present pastor being Rev. L. T. Grumbles of Celina. The Sunday School Superintendent of this church is Boyd Woodall, whose Assistant Superintendent is Byrd Brooks. The Sunday School has an average attendance of seventy-five nearly every Lord's Day. The old church here was destroyed by a cyclone in 1904. Rev. M. T. Tucker was pastor at that time. The present edifice was erected by the late J. W. Scruggs and G. W. James, two of the early pioneers to settle in this section. Lebanon has a modern school building with a well kept campus, beautified with shrubbery and evergreens. It is a two-teacher school. At the last term, the teachers were Miss Pearl Huffhines and Miss Hallie Maud Haggard. Each has had three years teaching experience here at Lebanon. The school trustees are J. K. Wade, John Robinson and Martin Yarbrough. The school is well furnished with swings, see-saws, and slides in the way of play ground equipment. These were secured through the efforts of the enterprising Parent-Teacher Association of Lebanon. Lebanon section of Southwest Collin is one of the principal grain growing parts of North Texas. This year we saw five combines running at the same time, two of them being in one field. As our readers know, combines both harvest and thresh the golden grain in the same operation and distribute the straw as it operates and leaves it in the field to enrich the ground for the following years crop. The E. G. Bryan home is located on the main north and south highway, just south of Lebanon. When we called we found Miss Eva Bryan alone and tuned in on one of our favorite radio programs. Miss Eva has been Secretary of the County Home Demonstration Council for the past several years. She is quite enthusiastic in the work of that local club and other sister clubs over the county. It will be remembered by our readers that her mother, the late Mrs. E. G. Bryan, was struck by a passing auto on the highway and instantly killed in September 1931. At the time of her fatal injury, she was loading her car with products for exhibit in the Collin County Fair. Thus her daughter in her civic interest and work, has the example of her sainted mother to inspire her in her efforts along the same lines of interest as her sainted mother engaged in. Mr. and Mrs. E. G. Bryan moved from Plano to the Lebanon community just thirty years ago. They bought their present farm from the Shelbourne heirs. In 1920, they erected their attractive and comfortable home, which contains eight rooms, two large halls, long porches, one of them being screened in. Mr. Bryan is a native of Georgia, coming from that state in 1892. He married the daughter of J. J. and Martha S. J. Strain in December, 1900. The Strain family originated in one of the Carolinas from which state they came in 1857, and settled near Plano. Six sons and three daughters came to bless the union of Mr. and Mrs. Bryan as follows: Oren E. Bryan, 5501 Miller Avenue, Dallas; Abner F. Bryan, Richardson, Texas; Joe Bryan of the Dallas Railway Terminal, Dallas; Mrs. Frank Haun, Plano; Robert, Paul, Mary and Eva Bryan, all at home with their father. An electric line from Plano furnishes power for the lighting of this hospitable country home. Miss Eva Bryan showed us a bedspread made by he grandmother that is now 120 years old. It is till in a wonderful state of preservation and of course, is a highly prized possession of the granddaughter. The spread was carded, spun and woven by the hands of an artist. The following inscription is woven into the fabric. "Martha Shannon, July 15, 1818." Still another home that we visited in the Lebanon community was that of Miss Nannie Moore, who is a daughter of the late Rev. M. Wolfe and wife. The family came to Texas from East Tennessee in 1889, located at Plano, but moved to Lebanon in December 1890. At this time the W. G. James family is the only family living here, which was then residing at Lebanon. John Stevens was the Postmaster who was followed in that capacity by G. W. Green. Norvel J. Grandburg carried the mail from McKinney to Lebanon. It was an all-day journey made over dirt roads, poorly graded and drained, in a hack pulled by a pair of mules. Among some of the prominent families of early days in the Lebanon community were the Wades, Capt. Johnson, Lee Gulledge, Tom Campbell, Mike Huffman, the Convingtons, Croziers, Hogges, Quisenberrys, Talleys, Dunaways, Abbotts, Scruggs, and the Yeagers. Miss Nannie Moore married B. P. Moore who died March 8, 1937. Their children are as follows: Edwin Moore, Route 5, Dallas; Miss Bernice Moore, 2600 Lancaster Road, Dallas; and Misses Juanita and Jewell, both at home. The latter is a graduate of the Frisco High School. Mrs. Moore has one brother, W. G. Wolfe, now living in Frisco. "The Home of the Madonna Lilies" would be a fitting one for the residence of Mr. and Mrs Dwight L. James. Mrs. James has acres of these beautiful lilies. This flower has become her hobby since Mrs. Moody, a good friend, now passed on, gave her a half-dozen bulbs to start with. She decided to raise them on a commercial scale. She has made shipments of these bulbs as far away as the state of Virginia. She now has 2,000 bulbs growing but the demand is greater than the supply. All that she can spare are already contracted for even well into next year. In the springtime, she has regular customers in Dallas, Fort Worth and at A. &. M. College as well as in the surrounding country towns and villages. These beautiful lilies are particularly in demand for the decoration of graves. They are so hardy that they stay fresh for several days. Mr. and Mrs. James own several acres of land on which they reside. D. L. James is a son of the late Mr. and Mrs. W. G. James and a brother of C. S. James. He is a painter by trade. His wife was the former Miss Etta Talley, daughter of Mr. and Mrs. J. T Talley of Lebanon. Her father came from the state of Tennessee, while her mother is a native of Tarrant County, Texas. Mr. and Mrs. D. L. James were married May 21, 1906. They have two children. Their son, Selden, lives in the home of his parents and drives into Frisco where he holds the position of mechanic in the Claude Rogers International machinery shop. Their other child is a daughter, Miss Doris, who has just recently graduated from the Frisco High School. We are mighty well pleased to be able to announce that she will henceforth serve as correspondent for the Daily Courier-Gazette and Weekly Democrat-Gazette from Lebanon. This lovable young girl was one of the prize-winning 4-H Club girls of our county. She won prizes in sewing and canning at both the Collin county and Texas State Fairs. She also won trips to Dallas encampments and the Short Course at Texas A. & M. College. She is really an asset to the news gathering facilities of the Democrat-Gazette-Collin's County's oldest newspaper, now in its fifty-fifth years, and also the Courier-Gazette in its forty-first year, having the distinction of being the only daily newspaper published anywhere in Collin County.